An ideal geografic contest only 10 km away from Pienza, Montepulciano and Montefollonico with a magnificent view on the last two. The atmosphere is magic and fascinating; when people come say that photos are unfair. bisquits, home made jams, tee and coffee in the cupboard, fruits. Running water directly from Amiata mountain. Soap for washing- machine and dish-washing. The last mile is a beatiful and confortable white road, only at the end, for 20 meters (more or less) it becomes a bit steepy but practicable by any kind of car and recently furthermore improved. P.S. If you don't receive answers within 24 hours pls contact me by the private mail. Clean , comfortable bed , private patio and well equipped with extraordinary view of Montepulciano, Montefollonico, and valdichiana. Central to Val dorcia and valdichiana. Loredana went above expectations as a generous host and we appreciated the bread and jam and butter and coffee on arrival and especially use of her pool Her excellent English and sincere and informative hosting made this trip memorable. Make sure you follow her detailed map and any car will do on the country road. Very pleased having known, hope seeing you again ! Beautiful, tranquil location with a wonderful host. My husband and I stayed here for two delightful weeks in September. Our host, Loredana was very welcoming and kind. Little touches like homemade bread and lemon marmalade on our arrival were part of a fantastic welcome. The house is beautiful and the view breathtaking. The location is a perfect base for visiting major cities, such as Siena and Florence and has gorgeous hill towns close by. The house has all the amenities you might need and is decorated tastefully and comfortably. We will definitely be back! An amazing experience we would love to repeat. All the positive reviews, about the location, the property, and especially Loredana, are all entirely accurate. It is simply beautiful. If you have the slightest opportunity to stay, please take it! The setting is just stunning. The views are amazing - watching the landscape views change as the sun sets is an experience you will never forget. The pool is fantastic too. Loredana is a great host. We can't say enough about the place - if you are looking for a quiet, relaxing, get away from it all place to stay then look no further. We stayed for one week and wish we could have stayed for at least another week - we will definitely return for a longer stay. you again in Tuscany. All the best to you. 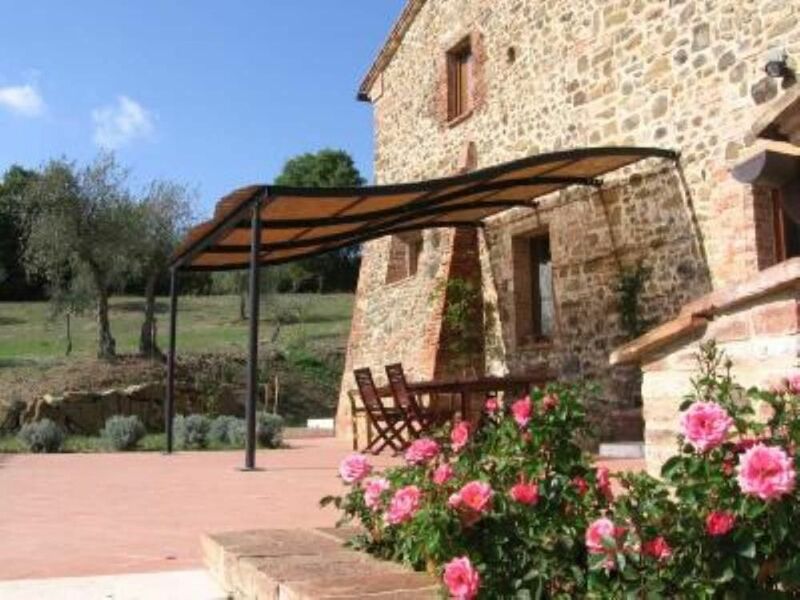 Loredana's property is the perfect setting for an idyllic week in Tuscany. The views are stunning and the surrounding area has so much character with endless hilltop towns to discover and explore. We had a brilliant time and would recommend it to anybody looking for a place to unwind. Loredana was very helpful before we arrived and during our stay, and we thoroughly enjoyed an afternoon chatting to her by the pool whilst we were there. Thank you Loredana and we hope to see you again soon. Grazie a voi per la bella amicizia che è nata. A rivederci ! (Text automatically translated) Florence-Rome motorway, exit Val di Chiana Overcoming Bettole and Torrita of Siena. From here head towards Pienza Km 7. Therms at St. Albino between Chianciano and Montepulciano.